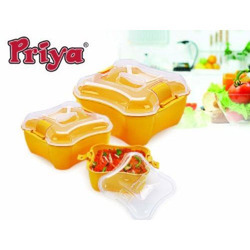 Providing you the best range of microwave safe containers, deep freezer safe containers, food storage containers, microwave containers for kitchen use and hinged containers with effective & timely delivery. 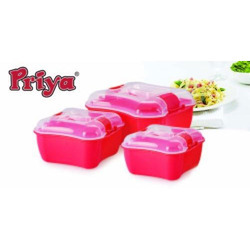 We are a trusted business entity, engaged as a manufacturer, supplier and exporter of a wide range of Microwave Safe Containers. Our offered assortment is manufactured with the aid of modern machinery and technology that is installed at our infrastructure unit. By meeting specific requirements of customers’ on-time, we have attained their maximum contentment. Adhering to the ethical business policies, we have become a known manufacturer, supplier and exporter of Deep Freezer Safe Containers. Manufactured in compliance with the industry set norms and guidelines, these containers are widely demanded in the market. Post-production, these containers are checked on various parameters to ensure flawlessness. 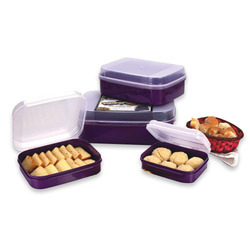 Acknowledged in the industry as a leading manufacturer, supplier and exporter, we are engaged in offering Food Storage Containers. Under the guidance of our team of adept professionals, these containers are manufactured to leave no scope for defects. In order to eliminate every possibility of defect, these containers are checked on various parameters by our quality controllers. 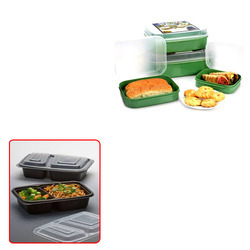 Well-known in the market as a manufacturer, supplier and exporter, we are engrossed in offering our customers with Microwave Containers for Kitchen Use. Attractive and spacious, these sets are developed as per the prevailing trends of the industry in accordance with the industry set norms and guidelines. 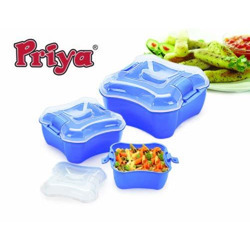 Manufactured using 100% pure virgin food grade plastic, these sets are widely demanded in the market. We have gained expertise in manufacturing, supplying and exporting a quality range of Kitchen Containers. Our professionals manufacture these products without compromising with quality. All our products are used for cooking and serving food. To meet the variegated requirements of customers; we offer these containers in a spectrum of sizes, designs, shapes and colors at nominal prices.